That quirky little song from my childhood keeps bopping about my brain as I’m trying to focus on writing to you all about how structure, specifically a straight shoulder, restricts the Gordon Setter’s reach in the front. If you’re showing or breeding Gordon Setters then you must certainly be aware of the Breed Standard, and thus are also aware of the angulation that is in order for the shoulder assembly. Now reading the words, looking at the dog, watching the dog move, and understanding why it is that a straight shoulder restricts the dog from reaching in the front, well that’s just not as easy as it sounds. To get where we need to go we’ll look under the skin and down to the bone for a clear picture of what we’re breeding, how it works, and why it works the way it does. First off, obviously a person or an animal with a longer stride covers more ground with less effort, and thus we have energy savings resulting in the ability to cover longer distances with fewer steps (must picture long-legged runners…not my stubby short legs). Hunting dogs such as our Gordon Setters need to be able to go long distances for long periods of time, so they need to have efficient structure that helps to retain their energy for the work at hand. Now actually, long legs don’t really have anything to do with shoulder assembly, and very little to do with the dog’s reach (I was just “pulling your leg” so to speak), but the reference did get you thinking about how the bones play the major role in how well the dog does, or does not, cover ground with the least amount of energy expended. That my friends was step one of this lesson. Maybe we all had that one down, but it’s always best to start at the beginning, right? 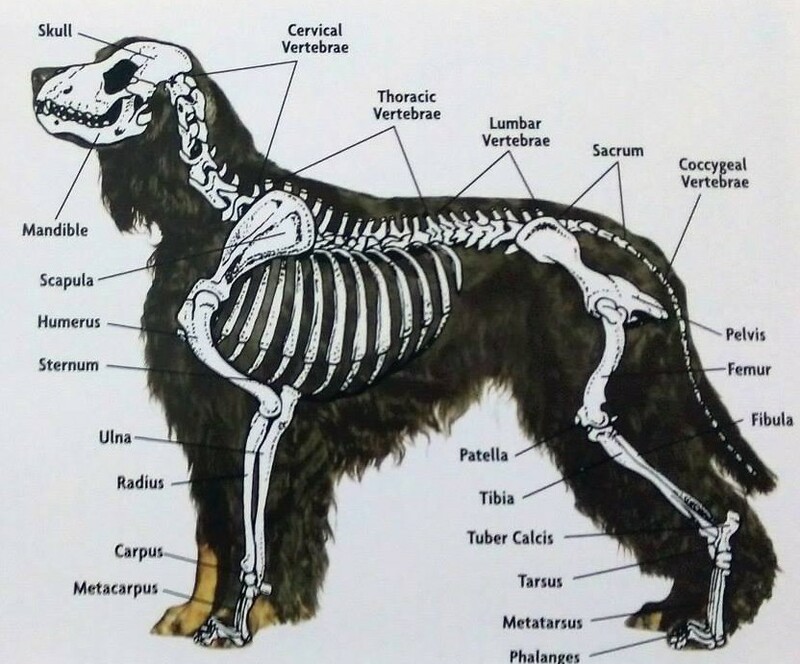 The dog’s shoulder assembly is unique as compared to the human shoulder as it is not actually connected by a joint, you know, like ” the thigh bone’s connected to the hip bone…” Think about it, the shoulder lies flat against the rib cage, and it is not connected to the skeleton, neither the rib cage nor backbone, not by any type of joint like those found at the hip/thigh/backbone. The front assembly, shoulder, upper arm and leg literally float on the body attached only by muscles and ligaments. This assembly is perfectly suited for the dog, a predator, as it gives the dog maximum cushioning and the flexible and agile movement that is needed to chase and catch prey, which for the Gordon Setter would translate into searching out and “setting” on wild game birds. This dog is Moonstone Maxwell Smart bred by Debbie Cournoyer, NY. Photo by Lisa Croft-Elliot was used in a book published in the UK. Gordon Setter by Lavonia Harper. So what is the function of the angulation (bones meeting at angles to each other) between the shoulder and the upper arm? First of all the angled bones provide levers on which the muscles exert force, which in turn changes their position to allow movement of the leg which propels the dog in the direction they wish to go. The two bones when properly angled to each other provide a much larger and broader canvas for the musculature that attaches the front assembly to the chest, rib, back and neck area, more space for muscle to attach provides more strength, more flexibility, and more agile movement. For the second function provided by this angulation one can look at the front to see that the angle between the shoulder and upper arm acts like a leaf spring (like the leaf springs on a carriage, wagon, or car) to provide shock absorption. Did you realize that the front of the dog carries anywhere from 65% to 75% of the dog’s weight? So without the flex provided by the two bones meeting together at an angle, the weight of the dog when moving would quickly break down the front. On a side note the shoulder-blade in a young puppy starts out fairly short and upright for maximum weight-bearing and later, as the puppy grows and uses his legs more over a period of months (years for a Gordon Setter) the muscles mature and define the adult shoulder placement. Yes, shoulder placement (angulation) can change in your growing Gordon Setter puppy and the muscling they develop affects this. The shoulder muscles and the angles between the bones develop by responding to the need for shock absorption during the stresses of gait. This is one very important reason why proper exercise during the growth period needs to be attended to, it does have some effect on the final structure of the adult dog. And while we’re on the subject of the front assembly let me draw your attention to that shoulder-blade (scapula). It is a very large bone, and is one of the slowest growing bones in the dog’s body because of that size. It takes longer for the shoulder-blade to reach its full length, longer than other bones in the body. You may find in the Gordon Setter that a young immature dog with what appears to be a wide shoulder (too much space between the tips of the shoulder-blade) at a year to eighteen months of age may continue to grow more length to those shoulder blades, so that by the age of two or three they have developed a much smoother looking shoulder assembly. This change happens as the shoulder blades on each side of the body grow longer, and as the these bones are angled on the body toward each other at the tip, the additional length that is added with maturity closes the distance between the shoulder-blade tips. This can be why puppies may look chunkier or rough over the shoulder, their shoulder blades are somewhat shorter in proportion to what will be the shoulder’s adult length, and so with full maturity of the bone structure and musculature one may see improvement and smoothing of this area from puppy-hood to the finally full-grown adult dog. Now then, to get back to the straight shoulder and why it restricts reach. 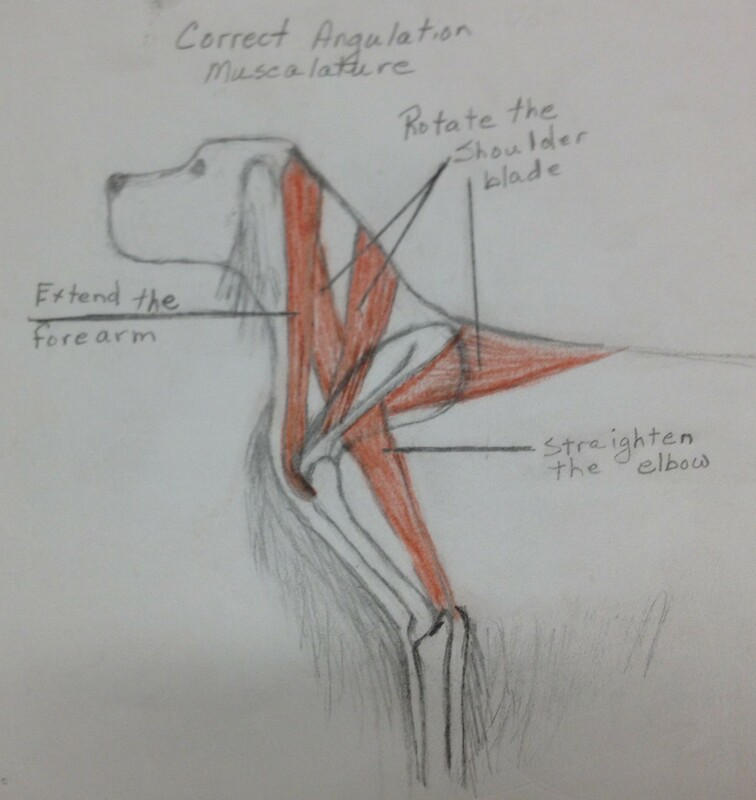 So, if there is no actual joint anchoring the shoulder and front leg assembly in place on the body, one would think that perhaps the shoulder would be able to swing more freely as it’s held in place by muscle, which would allow every dog to open up or reach out regardless of the angulation. Why then does a straight shouldered dog have less reach than one with the proper lay-back, what restricts or stops forward reach of the leg? First lets take a look at the principle muscles that work together to move the front leg forward shown in this illustration. There are many other muscles filling in this area on the body, those shown here are the primary labeled with their function. Proper angulation of shoulder and upper arm assembly with principle muscles attached. The joint that has the most impact on the amount of reach, or extension of the leg is the joint between the shoulder-blade and the upper arm. Here we go now with a bit of a geometry lesson as it applies to our Gordon Setter’s front. The muscles on the dog, when moving can rotate the shoulder-blade up to 15 degrees from the standing position of a 30 degree angle (from the vertical). Adding the additional 15 degrees of rotation when the assembly is at its maximum extension you get the 45 degrees which is the angle of the maximum stride length shown below on the first row of drawings illustrating a well angled dog. Note on the second row of drawings how the straight shoulder is limiting the reach. The straight shoulder is also limited to that 15 degrees of rotation but is starting from a steeper and more upright angle which, in turn, does not allow the leg to get as far out from under the body. Length of stride comparison between dog with proper front angulation and one with straight angulation in the front. Notice how much shorter the stride can be for the dog with a poorly angled front. Looking at the drawing below one can note the lack of balance found in the muscling of the dog who lacks proper angulation (is straight) in the front. Because the shoulder-blade is in a more upright position there is a more limited area for the attachment of muscles, the angles are just too steep to allow full development and proper length of the muscling. And, because of the angles at which the muscles are attached to the bones, there are limits to their mechanical advantage as well. (Think about using a lever and the effect the length and angle has on the power or movement at the opposite end). Shoulder and upper arm angulation that are too straight to allow for maximum reach in the front. Notice how there is not as much length for the muscles as this structure affects proper muscling of the front also. 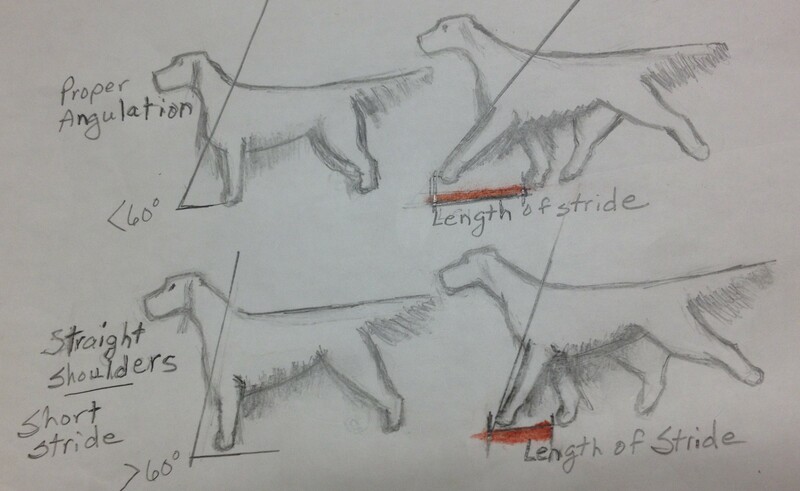 The end result is that the first dog (see length of stride illustration) the one with proper shoulder angulation, will be able to move easily on a loose lead with his head held at a higher (90 degree) angle to the axis of the shoulder-blade. This dog has a long stride (good reach) and will demonstrate a fluid, effortless gait assuming the rear is equally balanced and properly constructed. On lead and off this dog will look great, easy free-floating movement. The dog with the straight front assembly will be limited, having trouble extending his front legs and because of the steep angle he will probably lower his head which is needed to get more effective use of the muscles which move the leg forward. Dogs with straight shoulders often look like they are “hanging” on the leash as they use this device to assist themselves in getting the front more airborne. Because the dog has a shortened front stride, the rear legs, rather than reaching under the dog may kick up more behind, or the dog may move wide in the rear rather than single tracking to get the rear legs out of the way of the front legs when moving. If the dog is kicking up in rear to get those legs out of the way you may see that this dog moves “high in the rear” when looking at his topline. Sometimes dogs with straight shoulders may tolerate being trained to move “strung up” on the leash, and as the handler is helping him get his front off the ground by holding it in the air, this may allow the rear legs freedom to propel the dog forward. While this may look flashy at times, it is ineffective movement and a loose lead will show the true story. 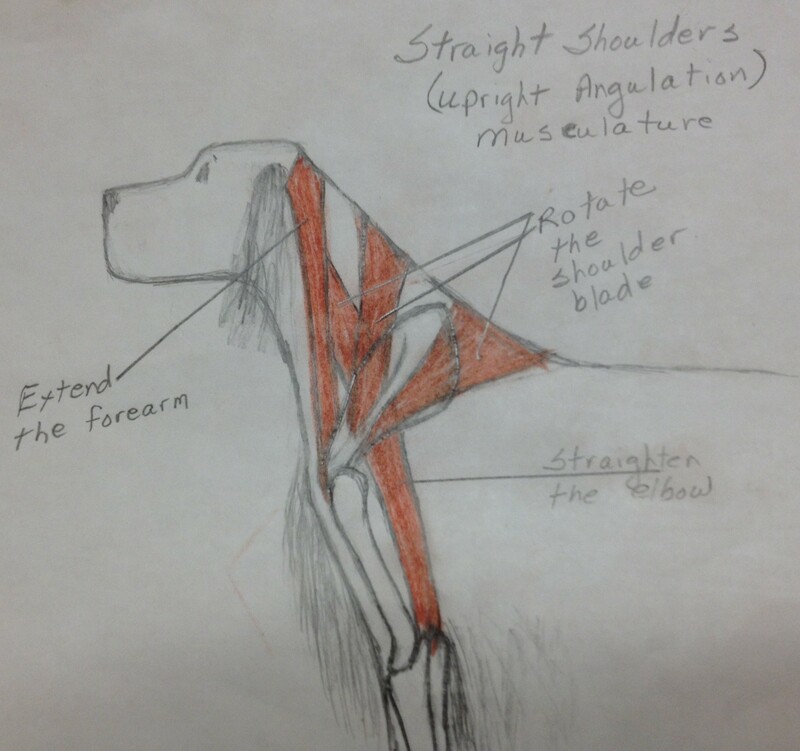 So, what exactly stops the dog from flexing the joint between the shoulder and the upper arm more than 15 degrees which would allow more reach if the dog is straight shouldered? The amount of extension for this joint is controlled by means of a notch on the top of the humerus. This notch stops the joint so that it can never open to 180 degrees, it is stopped about 15 degrees short of that angle. Thus the maximum angle of the upper arm very much depends on the angle at which the shoulder-blade is set on the body. Take a look at the illustration below for clarification. It compares the shoulder and upper arm connection on two dogs, the top row of drawings shows a dog reaching with a properly angled shoulder, and the bottom row shows the effect of the straight shoulder. In this illustration, you are looking at the shoulder (scapula) connected to the upper arm (humerus) connected to the leg (radius). Starting at the top left the first drawing illustrates the joints as the dog is standing, moving to the right is the assembly as it is beginning to flex, and on the far right as it is fully extended with the notch on the end of the upper arm closing the gap between itself and the shoulder. Next, by looking closely at the inner view of the shoulder to upper arm joint (provided in the blue circle in the very middle of the illustration), you will see that notch on the top of the upper arm bone, the built-in stopping mechanism that prevents the dog from extending the upper arm past a certain point as the dog reaches out when moving. So, in the moving dog, as the shoulder rotates in an upward motion pulling the upper arm out and forward (creating the forward reach of the leg below) the amount of outward movement, the outward reach of the leg below, is restricted when that notch on the upper arm bone is stopped by closure with the shoulder bone to which it is attached. The blue circle to the left shows the notch while the dog is standing still. The circle on the right shows the shoulder/upper arm joint fully extended as the dog reaches during movement and here you see that the notch has closed the gap, stopping any further outward movement of the leg below. 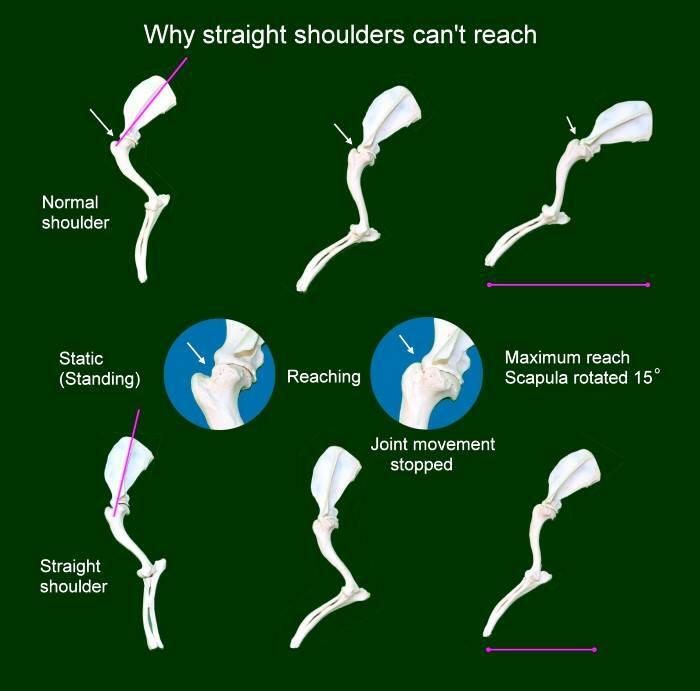 Moving down now to the bottom row of drawings in this illustration we see the effect the straight shoulder will have on the amount of reach that is allowed by this construction. The shoulder cannot rise to the same height as a properly angled shoulder due to it’s more upright starting position (see how much further that shoulder needs to rise up in order to move the upper arm outward) as the upper arm stops that upward and outward movement by the notch on its end closing with the shoulder-blade. Final result is that the leg bone (the part we are most likely to be watching when evaluating movement) cannot reach out as far … “to a place well under or past the dog’s nose”… like the well angled shoulder allows. Insight on the importance of the front assembly is also offered in our article “That Elusive Front” reached by clicking this link. For more information on movement and a study of the topline on the Gordon Setter see our previously published article “Moving Toplines” by clicking this link. Gordon Setter Movement – List of Reference Materials is linked here. Gordon Setter photos are included for viewing pleasure only and are not intended to illustrate any material presented here. PS Nope, never said I could draw. If there are artists in the crowd who are now cringing because of my illustrative artwork please do consider donating your more polished renditions …they would be appreciated by everyone, I’m sure! I guess it is safe to say that I’ve become a layperson-student of canine anatomy and locomotion. After reading this article last night and looking at this photo just now, it might be safe to say this is a perfect-to-near perfect shoulder assembly doing its job. I had to laugh though… I don’t know where all of her hard muscle disappeared to in this photo! Her forearm looks like it’s all bone and coat here, doesn’t it?! Previous PostPreferred Breed Type – Why the Stand-out Dog Can Be a Loser!Next PostGordon Setters Need To Play Games! Wonderful to hear! I remember well the struggle I had learning about shoulders and front assemblies so I wrote it with myself in mind as a newbie! So happy to hear I’m helping people! Good luck to you! Pingback: Miks elevandid ei hüppa ehk mis värk nende nurkadega on? – Koeraga võimlema! And here is another viewpoint – we are breeding far too many dogs, to our specifications. I firmly believe, that dog shows and those that take their dogs lack concern for their dogs dog. Dogs are sentient beings – not pieces of art for man to ‘fashion’ how he pleases. I’m sure, all you breeders and showers out there will be offended. Well it offends me, greatly to see these inhumane practises. (So many breeds have serious physical and health issues because of breeding them to some manmade standard). I find it abhorrent (I peak as a trainer and behaviour student). If a dog can move freely and easily with a minimum amount of energy expended because we humans choose to breed them to a standard that allowed that to happen I am at a loss to understand how that becomes an inhumane practice. This article deals with breeding a dog who can use their body freely and easily, and does not include breeding a dog with a serious physical deformity that hampers their quality of life because of a physical or health issue. I respect your point of view but do not understand how it is applicable to this article on breeding a sound animal. Peg, I’ll see what I can do to get the photo you talk about into this article for others to see. Thank you for the best description yet on something I think important in any breed, even if not a working dog. Would I be wrong to think upright shoulders in long backed breeds (dax, lhasa apso) mean a weaker ( longer unsupported) back? I hope some judges study your article…..if the let poor structure though we breeders are left defenceless. Show, show, show ends in a tottering wreck in some breeds (maltese etc) where grooming becomes the only standard. Thank you very much. Here’s a comment from a reader, Adrian Jones, posted on another page, anyone have any knowledge of this that they can share? That’s a new concept to me Adrian, something I’d not heard before. I’ll ask friends for some answers. I’m not sure exactly what is meant by a “loose front” but am thinking perhaps it’s referring to how the Gordon “sets” on a bird as they need a great deal of flexibility in the front, especially the shoulder, to properly drop into that set when on a bird. The position of the “set” was such that it allowed the hunter to throw a net over the bird which meant they needed the dog to be low to the ground to allow the net to clear their body and capture the bird. I’ll call on my other expert friends to see if we can get more information on this and your Australian dogs? Friends, if you can speak to this please comment here! I think Gordon’s moving at you can appear to move looser than the other breeds of setters. I don’t know if this is what she is referring to or not. The article dealt with the layback of the shoulder, but not the lay on of the shoulder. I’ve always attributed this as coming from increased width between the shoulder blades themselves. The standard calls for the shoulders to be “fine at the points”, and laying well back. The tops of the shoulder blades are close together”. With the bone some of these dogs are carrying, I think we have come to accept smoothness over the shoulder without noticable skin folds as being correct. I can remember the old “two fingers between the blades” rule from years ago. I’m not sure that’s beneficial to overall function either but I also don’t think it represents what the standard intended if the distance between the blades is the size of a fist, but the shoulders are smooth. That looseness in movement caused by poor lay on of the shoulder decreases the efficiency of the stride and, it seems to me, the dog could be more inclined to injury himself in the field. Janet Whalen – Great article.. I hope people find time to read this. Barb Kaye – I can only speak to my own breed, collies, and it is something we breeders CAN check for in our breeding stock. So can be bred away from. And a straight shoulder will impede the collie in herding and other performance sports. Wonderful examination of layback as it impacts locomotion! Not my breed, but I’m a physiological dog geek and look forward to more insights from you! Thanks so much Elizabeth! Your kind words help us to know we’re on the right track! Carla Rosierse – Very interesting, thank you for posting. Very good Sally. Another reason pups can be rough in shoulder and appear upright is simply that flat bones, like the scapula, grow more slowly than long bones. In enjoyed this piece. Knew you would Barb, we certainly spent some hours discussing it in our younger years! I did talk about the slower growth of the scapula later in the article as I think that’s very important for owners of young dogs as well as judges to know and remember.